Arsenal yesterday expressed their solidarity with Nigeria as the country celebrated its 57th Independence anniversary. The London club that was home to former Super Eagles’ captain, Nwankwo Kanu, defeated Brighton 2-0 to move to the fifth position in the English Premiership. Iwobi scored one of the goals, which Arsenal promptly acknowledged in their twitter handle. 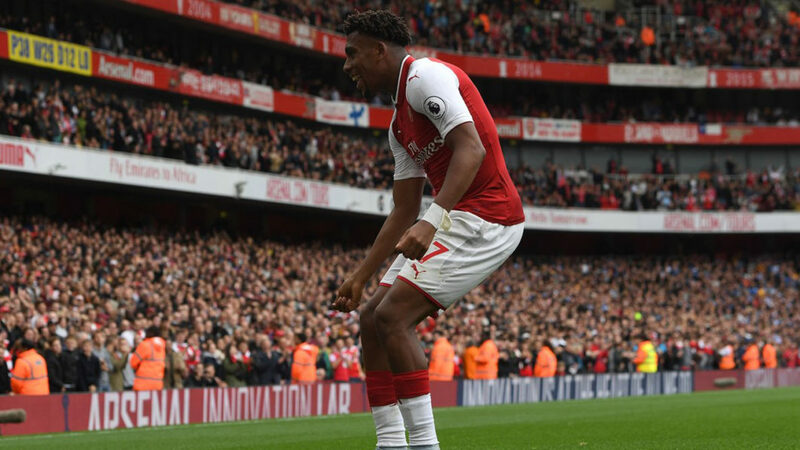 Nacho Monreal opened scores for the Gunners early in the 16th minute from close range, while Iwobi doubled it after the break to take Arsenal to the fifth position on the log on the same 13 points as fourth-placed Chelsea, who have superior goals aggregate. The victory came on the 21st anniversary of Arsene Wenger’s appointment as Arsenal manager. Iwobi’s return to action puts to rest the anxiety felt by many Nigerians over his availability for next Saturday’s Russia 2018 World Cup qualifier against Zambia. He is expected to arrive in Uyo today to join his mates in the build up to the crucial clash with Zambia. Already, China-based Odion Ighalo and Skipper John Obi Mikel have arrived in the country for the game. Ighalo came into the country from China on Thursday, while Mikel was expected to arrive yesterday. The team will be camped at the Le Meridien Ibom Hotel and Golf Resort, Uyo, which has been their base since the beginning of the qualifying series. Meanwhile, Super Eagles’ opponents in the World Cup qualifier, Zambia arrived in Accra yesterday to continue their preparation for the game scheduled to kick off by 5.00 p.m. on Saturday. Coach Wedson Nyirenda travelled to Accra with the first batch of six players and some technical staff yesterday before they were joined by the second batch, which arrived later in the day aboard a South African Airways flight. According to the Football Association of Zambia (FAZ), the foreign-based players are expected to join the camp in Ghana after featuring for their clubs at the weekend, while the team will arrive in Uyo on Thursday for the Group B encounter. Nigeria lead Group B on 10 points, Zambia is second on seven points with Cameroun on three points, while Algeria is stuck at the bottom with one point.